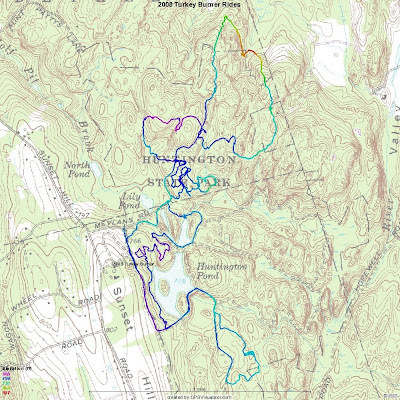 Here is the map of the CT NEMBA Turkey Burner Ride. The who, what, where can be found on the CT NEMBA Blog. My track is 9+ miles of most of the choice singletrack at Huntington SP. I experienced my first real mechnical where my chain broke. I think it was going to begin with but never checked it. BikerDave, the Trail Gnome of Wilton Woods, hooked me up with a quick link. I think I am going to get a bunch of those for the future for sure. Stemming from the broken chain I think there is something wrong with my rear derailler because as I was pedalling it would make a clicking sound. It looks like the cage may be bent. I think I might take it in and get a new chain, and probably replace the derailler with a medium cage anyway. The derailler has never been the same since hitting that rock or log last summer. That bent the hanger, knocked the derailler out of whack, and now this. Still, this ride was a totall hammer fest. I just about climbed everything. My earlier problems weighed heavily on my mind though. When I got home, I felt completely exhausted. Didn't take many pictures on the ride but shot some video that I put up YouTube. It's the same video on the CT NEMBA blog post. Decided to try a different type of sound track but I forgot to edit it so after the screen blanks you might want to stop it manually.